Below are some optional items that you can add-on to your children’s birthday party booking. Save time and energy with the purchase of Magic Wand Goodie Bags – guaranteed to make the magic last long after the party is over! Leif David will bring exactly enough Magic Wand Goodie Bags for everyone at your party. That way you won’t be stuck with party favours you can’t use or worse, running out and leaving somebody feeling left out. The wands make for a great souvenir of a magical birthday party. When you purchase wands for everyone at the party Leif David will include a 10 minute workshop after the show. 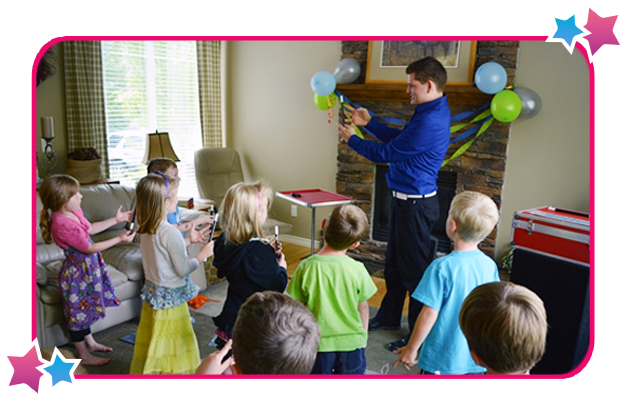 Leif David will teach the kids how to perform a few magic tricks using the magic wands. Don’t worry if you don’t know in advance how many guests will be at the party. Leif will call you the day before the party to find out approximately how many people you are expecting and he will bring along enough wands for everyone; including a few extras just in case those who didn’t RSVP show up too.